Rotherham recruitment specialists Elevation Recruitment, is again helping young engineers to prove that they can communicate effectively and "Speak Out For Engineering." An annual showdown, organised by volunteers from the Institution of Mechanical Engineers (IMechE), is being sponsored by Elevation. 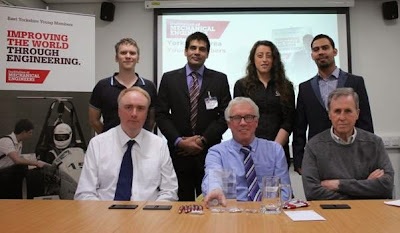 The event sees some of the region's most promising young engineers take part in the IMechE's "Speak Out For Engineering" (SOFE) competition - giving young engineers the opportunity to demonstrate and develop their skills in presentation and public speaking. With backing from Elevation, 2014 saw the revival in Yorkshire of the SOFE competition which was originally established in 1964 to challenge young engineers to prove that they could communicate effectively, which is still an important area for today's developing engineers. IMechE is an independent engineering society working to raise the profile of mechanical engineering. Elevation Recruitment, which recruits across a number of specialist areas including manufacturing and engineering and works with local firms including Greencore and Smith & Nephew, said the sponsorship was in line with their commitment to supporting the future generation of engineers. Started as part of the Horbury Group, Elevation was founded in 2010 and has expanded quickly. It now has an annual turnover of c£4m, and employs more than 45 consultants recruiting across eight specialist divisions. Last year, a six figure deal saw the business acquired by a newly formed parent company, Elevation Consultancy Group, headed up by group managing director and Elevation founder Greg Parkinson and supported by fellow board director, Lee Bhandal. Following a close competition, Linda Paine, a MEng Mechanical Engineering student at the University of Hull, was announced the winner, followed by runner up Adnan Fazal. John Bohan, head of the Manufacturing and Engineering Division at Elevation said: "This is a fantastic opportunity for young members of the manufacturing community to demonstrate their passion for the work they do, and to present to some of the region’s leading industry professionals. "We are proud to have the opportunity to continue to support this initiative, and we continue to be impressed by the calibre of the entrants who put themselves forward to take part." Winners from each area will take part in the Regional final, due to take place in early 2015, and the winners will be announced at the Yorkshire Regional Annual Dinner, at the Cutlers Hall in Sheffield on the March 13.